Who better to launch British Flowers Week than Paul Thomas, florist to the quintessentially British institution, The Ritz? Paul founded Paul Thomas Flowers 24 years ago, and has been creating spectacular flowers for events, weddings at some of the most prestigious venues in the country ever since. Amongst his admirers and close collaborators is Lady Elizabeth Anson, the society party planner, and it is rumoured that even HM the Queen can spot a Paul Thomas design. "I have had a love of flowers for as long as I remember," says Paul. "And when I watched an episode of Upstairs Downstairs in which they decorated the dining table for a party, I knew immediately that this was what I wanted to do." Paul was introduced to the legendary event florist Kenneth Turner by Lady Pulbrook, and his career had begun. "I learnt the art of event floristry from Ken Turner. He was my mentor," remembers Paul. "He taught me to question the rules and break them, and to think on a big scale." It was with Kenneth Turner that Paul first stepped through the doors at New Covent Garden Flower Market back in 1984: "I was looking for flowers for a 25th wedding anniversary for a friend of my mother. I had a very clear idea of what I wanted and how the event would look." Not so clear was Paul's understanding of what would be available at that time of year: "None of it was there – it was all out of season! It is experience that teaches you that." Thirty years on and Paul's inherent passion for flowers has not abated. 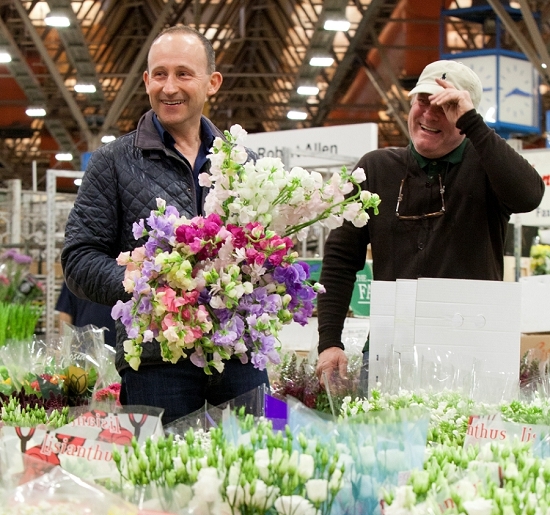 "I am thrilled every day that I visit the Flower Market," enthuses Paul, who buys all the flowers, foliage, plants and sundries for his shop in Mayfair, online flower shop and event business at New Covent Garden Market. "I simply can't fathom why some people don't come here. It's inspiring. The flowers are constantly changing. The wholesalers get excited too about the first arrivals of the season or something that's looking particularly good. On Wednesdays' I have five people at the Flower Market, researching what,s available and looking good, writing lists of flowers needed for specific jobs." So what is Paul's relationship to British-grown flowers? "Very few of my clients specifically ask for British flowers," admits Paul, "but it is important to me." As the weather can affect the availability of British flowers, Paul chooses to buy them as he spots them looking good in the Flower Market and where the client's brief is more open and accommodating. He loves to see what Graeme Diplock on Zest Flowers has to offer, talks to Pratley and SR Allen, cherry-picking as he goes. "There is always something exciting," says Paul. "I use British as a treat. I have been watching arum lilies recently, and snapped them up when the quality was just perfect! The price of British flowers in season is good too, so you can use a single variety en masse to create an abundant look." 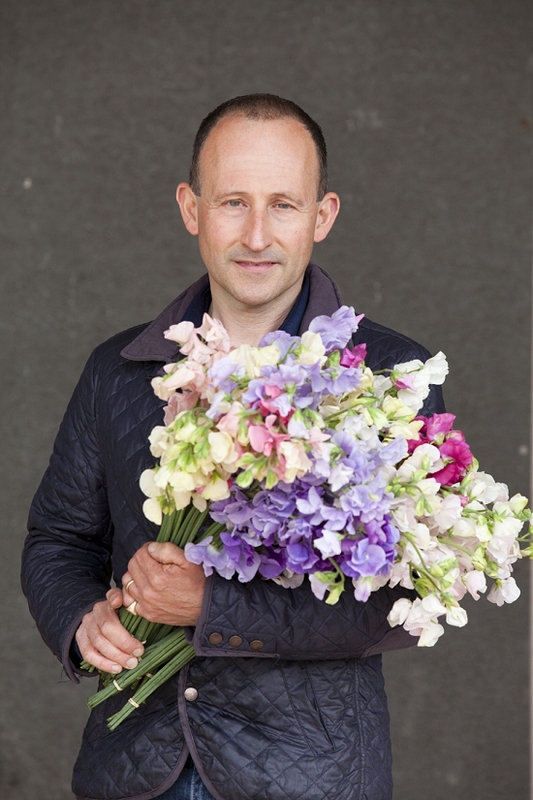 There is one British flower that Paul feels confident enough to pre-order and always finds the quality to be exceptional, and that is the humble sweet pea, Paul's favourite. Find out why here. Paul is a great fan of British foliage, as offered by the Flower Market's foliage specialists GB Foliage and Porters Foliage. "British foliage is vital," says Paul. "It separates the independent florist from the multiples, who use a bit of salal, ruscus or leather leaf." Outdoors on Foliage Row, British foliage dominates and so the seasonal variations are particularly marked. In summer, Paul is spoilt for choice with stems of flowering shrubs such as weigela, viburnum, cornus, cotinus, philadelphus and hebe, deliciously fragrant British herbs, eucalyptus and towering branches of sorbus and more. 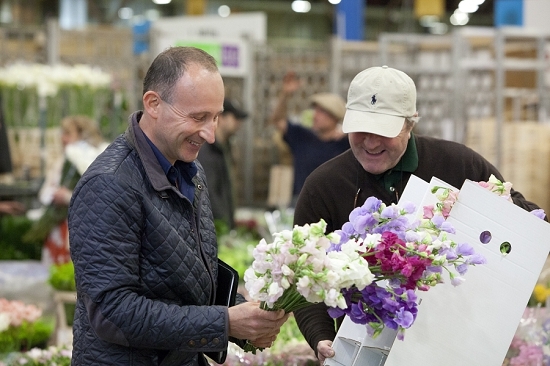 Paul Thomas came to New Covent Garden Flower Market recently for a British flower workshop with four other leading London florists and devotees of the Flower Market. It will come as no surprise to learn that his focus flower of choice was...the British sweet pea. See the gallery of Paul's work here.